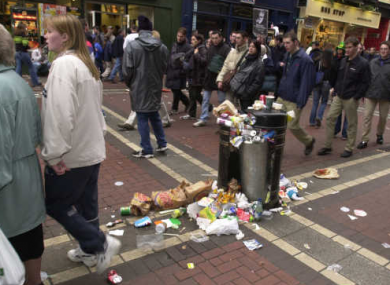 FINES SHOULD BE doubled to deter people from littering, according to Fine Gael Senator Catherine Noone. The Dublin Senator doesn’t think it’s fair that taxpayers foot the bill for cleaning up litter, while those responsible aren’t punished – or not punished enough. Noone said that Council resources were “stretched to the limit” last night as a result of the increased amount of littering that took place due to Halloween. “The reality is that the proceeds of our rates and our property taxes will be used to clean up the mess. She wants the maximum littering fine of €150 to be doubled for ‘minor’ offences, while calling for more serious incidents of littering to carry a fine of up to €1,000. “There’s no excuse for engaging in the activities of a bygone era, littering and ruining our greens and parks at great cost to the city. Therefore I believe that a bylaw should be put in place which increases the litter fines issued. Everybody is fed up with littering on our streets and at Halloween it happens on an industrial scale. Noone noted that although this issue is particularly timely at Halloween, “it’s applicable all year round” everywhere in the country. She said that she was shocked when her colleague Boyle Councillor Maura Hopkins posted a picture of discarded nappies and other litter on Facebook recently. Noone said that this type of “disgusting” health and safety issue “warrants a serious fine” – in the region of €1,000. The Senator stated that people who litter would be more likely to change their ways “if they felt it in their pockets”. If you want to report any incidences of litter or illegal dumping to Dublin City Council you can do so here. Poll: Do you think community service should be given for less serious crimes? Email “Did you add to last night's Halloween litter? This Senator wants you to be fined...a LOT”. Feedback on “Did you add to last night's Halloween litter? This Senator wants you to be fined...a LOT”.